A night that started with a big Timberwolves run out of the gate ended with Ricky Rubio swishing a last-second three pointer to win it for Minnesota. Oklahoma City is now 4-8 since the All-Star break. That stretch has included a pair of tough losses to Golden State and a big win against the Clippers, but the team has been wildly inconsistent and they’ve dropped every close game they’ve been in. The Thunder are floundering for stability at a time when they should be clicking and solving the tough lineup puzzles their lumpen roster presents. Any squad led by Russell Westbrook and Kevin Durant has championship potential, but this year’s iteration of the Thunder don’t appear nearly that threatening. Something’s wrong. Even when Durant and Westbrook are turning it over as much as they have been lately, the Thunder maintain one of the most efficient offenses in the NBA. They’re second in offensive rating for the year, but that belies the faults within OKC’s scoring attack. The Durant-Westbrook duo have always led stagnant offenses, and this year’s is no different. According to Synergy Sports, they only run isolation plays the eighth-most frequently in the NBA, which is a surprisingly low, given how much flak they get for their isos. That many isolations is not ideal, but when you have two devastating one-on-one scorers, you can afford to let them work. The Thunder’s real problem is predictability. Their roster is stocked with a bunch of one-dimensional players. Steven Adams scores in the post, whoever plays shooting guard stands around, Serge Ibaka primarily spots up, and the two stars drive and shoot from the perimeter. Durant and Westbrook use a combined 62% of the Thunder’s possessions, which is the most of any duo in the NBA by a wide margin. Combine that with the fewest passes per game of any team in the league, and you have an utterly predictable offense. You can’t stop an athletic missile of a point guard and a shooter the height of a redwood every play, but when you know there’s an overwhelming statistical likelihood for just a small amount of possibilities, you only have to set up your defense to deal with a few scenarios. OKC still scores more points per 100 possessions than anone but the Warriors, yet their -3.9 net rating in clutch situations (per NBA.com) hints at scoring problems when opponents are at their most locked in. They’ve slipped defensively as well. Serge Ibaka isn’t nearly the anchor he was a few seasons ago when he was a fringe Defensive Player of the Year candidate. His block percentage is half of what it was when he led the league in 2011-12, and nobody looks scared to go at him anymore. The best lineup the Thunder have is Durant-Ibaka-Westbrook-Enes Kanter-Dion Waiters. That group has the second-best offensive efficiency of any lineup in the league who’s played over 100 minutes together, but Waiters and Kanter are sieves, and the group’s defensive efficiency would rank dead last in the NBA by a mile. Steven Adams has usurped Ibaka as the team’s best post defender, but he doesn’t stretch the floor or switch onto guards as well as Ibaka. For all their problems, OKC is still an elite team with some serious advantages. The gap between their offensive rebounding rate and the second-best team (Detroit) is the same as the gap between Detroit and the 18th-place Brooklyn Nets. 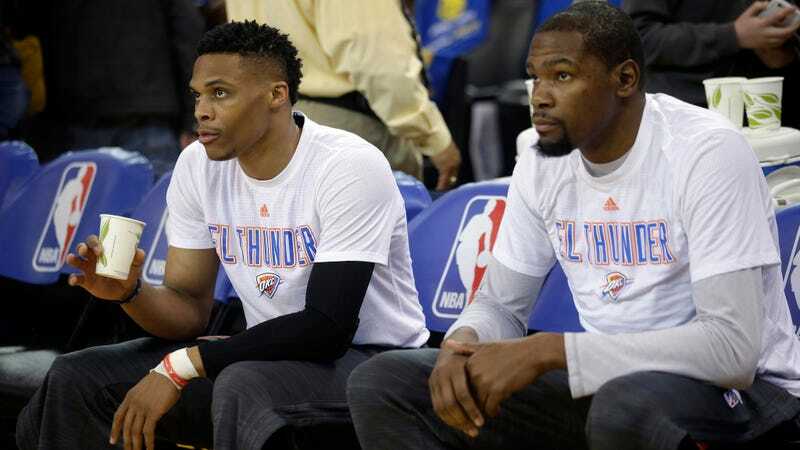 Westbrook is enjoying the best shooting season of his career and Durant is back playing like he did when he won MVP. Every advanced yardstick you can think of that measures overall impact on the game has both players among the league’s very best (here, I’ll pick one: they’re third and fourth in win shares per 48 minutes). Donovan has abandoned the nonsensical rotation patterns of Scott Brooks, and one of the two is almost always on the floor at any given point. I don’t know if the Thunder have the bench to truly make a run at Golden State or San Antonio in a seven game series, but I think that possibility isn’t quite as distant as it seems. Their best chance to spring an upset might be to embrace their flawed identity, and try to win through the sheer brute force of Westbrook and Durant’s talents. Running that all-scoring lineup might be a disaster defensively, but if they can score with that kind of efficiency for any extended period of time, it’ll be hard for most opponents to keep up, no matter who Kanter and Waiters have to guard. That might not be the most rational solution, but it’d be the least invasive method given how much they already lean on their two superstars.